Natalie with her weaving, Temple of the Moon. What made you fall in love with weaving? Weaving feels like coming home to me. It's supportive, it holds me. It's a place that I've made for myself that in turn has made a place for me. Finding weaving was like walking into a secret garden, one that you always hoped existed, but didn't quite know how to find or even imagine. Everything about weaving just felt right, even when I didn't know what I was doing. I still don't always know what I'm doing, but it still feels right. Natalie Novak, Big Yellow (2013-2014). You used to dance ballet. How does weaving relate to dancing? I think weaving is very much like a dance. You're partnered with the loom and the fiber and all the motions you make together create something magic. It's a process, it's a performance. As a medium, weaving has allowed me to explore the existential and express it in the physical world the same way a dancer might. Weaving helps me move through the interior sludge instead of miring in it. The end result of dancing is intangible while the end result of weaving is cloth, but they both require intention, repetition and a body in motion. And so many years of classical ballet have helped me keep good posture sitting long hours at the loom. When is a time you've experienced healing through your weaving practice? Weaving is healing all the time: it is meditation, it's color therapy, it's a connection to our human ancestors! Having a connection like that is an incredibly powerful gift, if you're at the loom, you're never alone. I like to think about the millions of weavers past, present and future who I'm tied to just through the simple act of weaving. We may never meet, but we share an experience that transcends space and time and that seems like pretty good medicine to me. In a more palpable sense, weaving has introduced me to a slower pace that helps keep me present, something I feel like I have difficulty doing in so many aspects of my life. My brain tends to spin and my body tends to get tense and weaving helps me step out of that reality and into one where time isn't as linear and what matters most is the color, texture and shape of right now. Weaving at the loom is so slow and tactile I feel much more connected to the work I'm making. It gives me space to process thought and emotion in ways I haven't found elsewhere, weaving gives me room to breath. Natalie Novak, Mt. Shasta and the Lemurians (2013). You're teaching Southwest Weaving Techniques at the Weaving Kind Makerie. Talk a little bit about how Southwest weaving techniques have influenced your work, and why it's valuable to explore different types of weaving. I first learned to weave on a Navajo style loom. The tools are earth-based and beautifully uncomplicated and the whole process has a specific order and direction. The final size of the weaving is determined by the warp which is finished before the weaving begins. Traditionally the weaver doesn't use a cartoon, instead she keeps the design in her mind. Weaving this way is like poetry, you have to be willing to let go of what you think you're making in exchange for what is actually happening on the loom in the moment. You learn to make adjustments to your design that keep harmony with what you've already woven while the weaving follows a new path to the top of the loom. In part, I think it's these constraints that have led to the creation of complex and sophisticated patterns on such simple looms. The Navajo weavers use these limitations to advance their designs instead of letting them impede their weaving. The focus is on holistic beauty instead of production speed. The first several pieces I wove borrowed many patterns, especially from Navajo and Zapotec weavers; it's how I learned the language of weaving. As beautiful as I found them, the designs didn't really belong to me and I needed to find another way to express what I wanted to say in a vocabulary of my own. My body already knew the basic motions when I started to learn new tapestry techniques and weave on different types of looms. I've learned from many teachers, trying a little of this and a little of that and slowly mixing it together in a new language of my own. My hands have led the way to a style of weaving that feels direct and authentic to me. Natalie Novak, Spider Woman (2012-2013). You studied at the Damascus Fiber Arts School, where you worked with an older generation of weavers. How did you benefit from knowing them, and why do you think weaving in community is important? What's different about the older and younger weaving generations? The school itself has been around since the 1960's, and it's currently run by weavers Audrey Moore and Terry Olson. What's particularly special about the Damascus School is that it is so community oriented. For the most part people don't just show up and learn to weave, never to be heard from again. They stick around, sometimes for decades. On any given day there are around 20 weavers, each working at their tapestry loom or a Navajo style loom in one of the two rooms of the 19th century school house that DFAS calls home. It's a charming place and the people are incredible. They are generous with their time, their knowledge, their weaving books and their yarn. There are so many stories shared about weavers and weaving, in a way it's a living library. Audrey turned 91 this past year and if I had to guess I'd say the average age of a weaver at the Damascus school is about 70, maybe 65. Collectively, we're talking about centuries of weaving experience. The weavers at Damascus aren't there just to weave, they're actively working towards creating an educational, loving, encouraging and fun environment, that sort energy doesn't happen alone in a studio. Competition and critique aren't really a part of it, I mean, we work to improve our designs and techniques and color choices, but never to out do one another. No one's worried about whether or not anything will sell or if a thousand strangers on social media will double tap anything they make. Everyone is really interested in weaving because they love weaving and we just share weaving with each other all day long. It's beautiful, it's healthy, I wish everyone had a version of Damascus they could go to. I think part of the generational difference is that the younger generation is so much more virtually oriented and the older generation gathers together in real life more often. Don't get me wrong, we email each other outside of school and people pull out their ipads all the time to share things they've found on the internet, but we're actually physically together in a room, talking face to face. That's invaluable, the real human connection. And it makes it so much easier to borrow yarn! Natalie Novak, Temple of the Moon (2016). What excites you most about the young (40 & under) weavers of today? Mostly that they exist and there seem to be so many of them. And they seem so eager to learn and be part of a community. In the past when I told people I'm a weaver, I often got the feeling that they were imagining me in an historical reenactment village wearing some sort of period costume. Or sitting in a hayloft spinning gold from straw or something. But more and more often people get it, or at least get something like it. The magic of the internet makes it so easy to share what we're doing right now and right now a lot of people seem to be weaving. The sheer volume of weavers today is breathing new life into the art/craft, it's experiencing a revival. It feels good to have something you love get recognized as valuable and worthwhile. And I find it exciting to see so many different weavers pushing their work in new directions or working to master traditional techniques. Talk about a meaningful weaving that you've made, and what you learned from it. 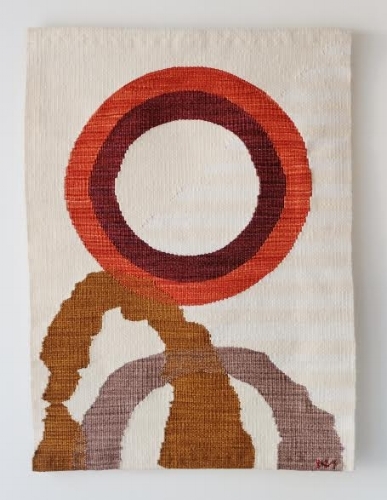 Last year I wove a series called “Rituals” that was based on weaving with intention and the act of weaving as an incantation. Basically weaving as spell casting if you want to be witchy about it. Part of that series is a set of mirror image pieces called “Temple of the Sun” and “Temple of the Moon” that are essentially interior landscapes. I wove them to create a new home for all the junk that knocks around in the psyche; ecstatic joy and paralyzing fear and all the feelings that live in between those two extremes. It felt really good to create a place (even if imaginary) to sort all that stuff out and let it go. Or at least recognize it and move on instead of lugging it around all the time. I mean, I didn't achieve total enlightenment by weaving those two tapestries, but I think it made me realize the power of symbol and process in art. Creating a visual language and a using a physical practice to reveal it was a really cathartic way to move through emotions that I've had trouble understanding or have been too afraid to bring out into the light of day. Weaving is a whole lot more than an art or a craft, it's really a friend. Natalie Novak, Temple of the Sun (2016).